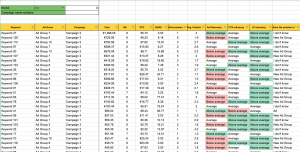 This script is really useful for long term ad A/B testing for bigger accounts. Track changes or additions to the Ad Group and calculate statistical significance for A/B testing from a specific date. You can see the date range for each test in the Dates list. 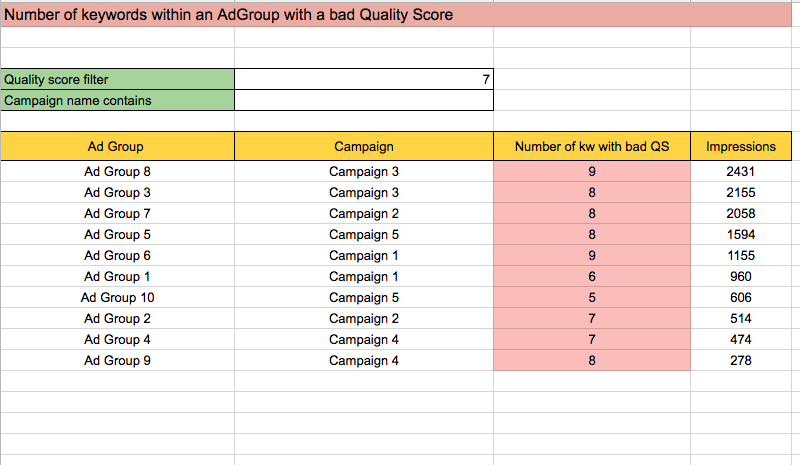 Once the test has reached at least 95% significance, and the Ad Group has 2 or more ads, more than 50 clicks, and 500 impressions for the test period, you will find a list of the Ad Groups which are finished testing in the Results sheet. If/when you make any changes to the ads in the Ad Group (pausing an ad or creating a new one), the script will automatically detect the change and start gathering new data on the day the change is made. If the Results sheet is empty, then the A/B tests are still running and there are no results currently available. In my post we will look at how you can use OpenRefine to retrieve data from Google’s autocomplete. Using this method, you can get more usable keyword ideas, which can be used for classification analysis of keywords or can even be incorporated into your PPC campaigns. Ok, enough talking. Let’s get started! OpenRefine Tool. I recommend the latest beta version 2.6, which has fixed a lot of the mistakes from the previous versions. 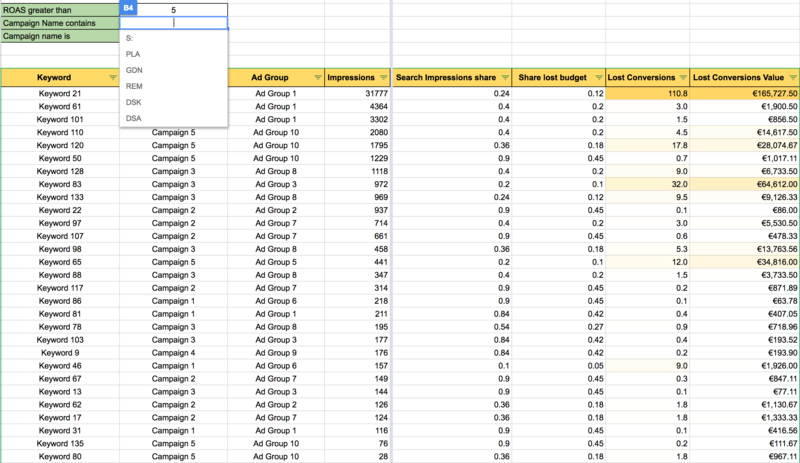 Keyword suggestion tool in AdWords. Keywords from Google Webmaster Tools. This script is really great for daily overview of your account’s performance. ROAS trends for yesterday, 7 days, 30 days for each account. Color indication if performance(ROAS or CPA) does not meet set targets in each date range. 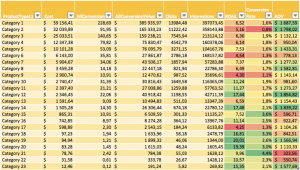 Performance information for conversions, cost, and impression share metrics. View the most important performance metrics side by side over 3 different time periods. Linear prediction of your cost at the end of the month. You can set-up the configuration for ROAS and Cost in the Settings list. Uses MCC parallel function. You can process up to 100 accounts per run. This script is useful for getting more search suggestions. It will generate a CSV with many keywords for you to use. 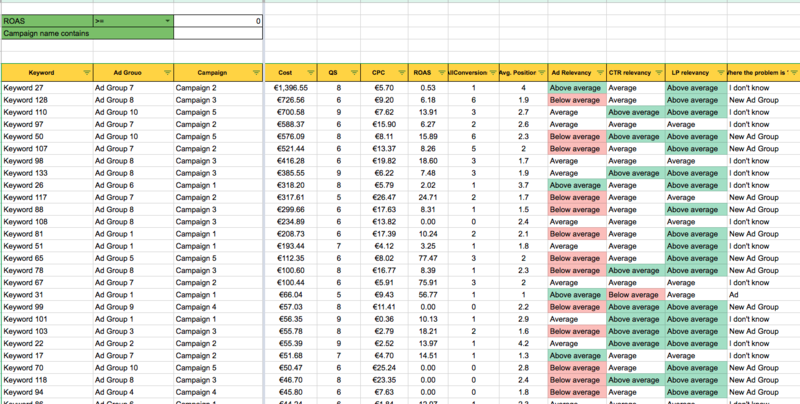 To begin, you will need a simple spreadsheet with only one column called Keywords. In the settings of the script, input your source spreadsheet URL and the sheet name, which will be used in the final CSV name. Paste the code into this column and run the script. 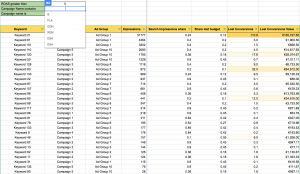 I have prepared two videos with exercises for you to become more familiar with Google Spreadsheet functions. The videos are below, and you can download a copy of the exercise spreadsheet here. In this article I would like to show you how you can use the AWQL generator we developed in our company. 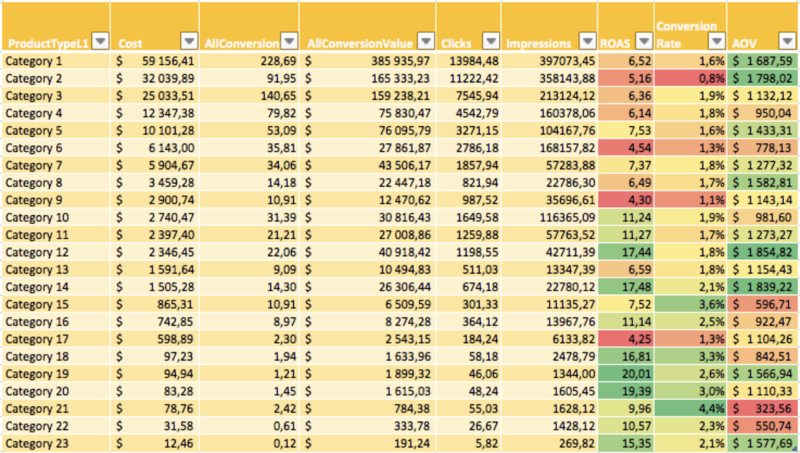 AWQL generator uses the AdWords Query language, which allows you to easily pull data from AdWords and combine it with other simple functions in your Google Spreadsheet. I’ve put together a short list of the obstacles you might face with AdWords API and how to deal with them. It may seem overly simple, but you need to think about what type of report you want. If you want to generate a report of the search queries then you need to choose Search Query performance report. If you want to see account data, choose Account Performance report. It’s not complicated, but it’s important to keep it in mind. What’s the time between orders? What’s the average profit per customer? What percent of customers return? Downloads the complete performance history of all products for a given period of time (you can set the number of days back on line 4, i.e. typing “30” will download history for the last 30 days). Generates a CSV file that contains all the data. You’ll find the CSV file in your Google Drive or script protocol. You can then manipulate the data according to your needs in order to analyze it, regardless of the historic PLA campaign structure. © Copyright 2016 Lynt services s.r.o.